Classic Film and TV Café: This Week's Poll: What was the Best Prime Time Soap on U.S. Television in the 1980s? This Week's Poll: What was the Best Prime Time Soap on U.S. Television in the 1980s? Backstabbing! Cat-fighting! Corporate takeovers! Expensive fashions! Prime time soap operas dominated the first half of the 1980s on U.S. television. For the 1984-85 TV season, four soaps finished in the Top Ten for the year: Dynasty (1); Dallas (2); Knots Landing (9); and Falcon Crest (10). 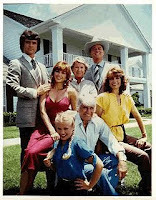 The show that started this 1980s infatuation was Dallas, which debuted to modest ratings in 1978. By the end of the 1979-80 TV season, it had become a solid hit, finishing #6 for the year. In that season’s final episode, someone shot the dastardly J.R. Ewing—a cliffhanger that captured the nation’s attention and propelled Dallas into a megahit. For the next five years, it finished in first or second place every season. Naturally, imitations followed quickly. The first was Knots Landings, which was considered a Dallas spin-off even though creator David Jacobs conceived it first. Knots was followed by Aaron Spelling’s Dynasty, which struggled through its first year, but came into its own when Joan Collins joined the cast at the start of the second season. Dynasty eventually supplanted Dallas as television’s #1 show in 1985. It even spawned its own spinoff called The Colbys (which never caught the public’s fancy). A few other soaps enjoyed modest success, such as Falcon Crest, but most of them struggled. The failures included Flamingo Road, Secrets of Midland Heights, Kings Crossing, and Emerald Point, N.A.S. Dallas – The saga of the Ewing family and its oil empire survived its share of major cast changes and bizarre plots—thanks mostly to its villainous protagonist J.R. Ewing. As played by Larry Hagman, J.R. was ruthless and egocentric, but he could also be funny and charming. And every once in awhile, he’d do something good! That kept viewers hooked even when Donna Reed temporarily replaced the beloved Barbara Bel Geddes as matriarch Ellie Ewing and when a whole season was explained away as a dream. Dynasty – Blake Carrington, like J.R., was an oil tycoon…but the similarity ended there. Blake (John Forsythe) was a member of the jet set, which posed challenges for his much-younger bride and former secretary Krystle (Linda Evans). The first season was tough, but it got much worse for Krystle when Blake’s ex, Alexis (Joan Collins), showed up in season two. The nasty Alexis resented Krystle immediately and their mutual dislike escalated into several memorable catfights on the show. Emerald Point, N.A.S. – The N.A.S. stood for Naval Air Station and Emerald Point was a fictional base in the Southern U.S. commanded by Rear Admiral Thomas Mallory (Dennis Weaver). Much of the drama centered around Mallory’s three daughters: Celia (Susan Dey), Kay (Stephanie Dunnam), and Leslie (Doran Clark). Despite an interesting setting and good cast (Robert Vaughn, Robert Loggia, Jill St. John, Sela Ward, and Patrick O’Neal), Emerald Point, N.A.S. languished in the ratings and was canceled after a single season. Falcon Crest – Who needs oil when you can run a winery empire in scenic Tuscany Valley (a fictional version of Napa Valley)? Jane Wyman starred as Angela Channing, the ruthless (what else?) owner of the Falcon Crest Vineyards. Unfortunately, her moral nephew Jason Goberti (Robert Foxworth) inherited a portion of the family’s business. Falcon Crest was created by Earl Hamner, who envisioned it originally as a family drama similar to his hit series The Waltons. He tweaked the formula when CBS wanted another soap to schedule after Dallas—resulting in a successful nine-year run for Falcon Crest. 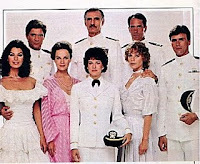 Knots Landing – Loosely inspired by Ingmar Bergman’s Scene From a Marriage, Knots Landing began as a drama about three families living in a cul de sac in the fictional Southern California town. Its Dallas connection was that J.R.’s brother, Gary (Ted Shackleford), was one of the residents. To spice up the proceedings, Donna Mills joined the show in the second season as Abby Fairgate, who served as a female J.R. (though far more subtle). Indeed, Knots was known for its strong female characters played by Michele Lee, Joan Van Ark, Constance McCashin, Michelle Phillips, Julie Harris, and Mills. Those are your nominees for best prime time soap of the 1980s. Cast your vote in the green sidebar on the right! For some of the most intriguing storylines, I would have to choose Knots Landing. It kept reinventing itself, adding William Devane and Nicollette Sheridan into its cast of solid performers. Fun poll, Rick! I would have to go with KNOTS LANDING, too, Toto. I wasn't a big William Devane fan until that show. He was an excellent as Greg Sumner, who could be nasty in one scene and a caring father in the next. Three-dimensional characters and complex relationships always make soaps more engrossing. Rick, I voted for Dallas. It is the only Prime time soap opera that I watched. Rick, I never really watched any of these shows so I'll have to take a pass on this weeks poll. I am rather astounded Paul2 would admit to not having seen any of them. To do that you've to be hiding in a cave. They were everywhere. My wife and I watched Dynasty from the second season to its demise. She for the fashions, and me - well I've always a good catfight. And Joan Collins is - well just say her name and you think CATFIGHT !!! Austin 2, Long Time.I was not in a cave the shows just did not do it for me. I was busy on Friday nights when Dallas & Crest was on and wasn't Knott's up against LA Law on Thursday night? Bond Is Forever: "Live and Let Die"